A back test of the 2085-90 zone would not be unreasonable, but presently I expect the market will then be sold to new lows. 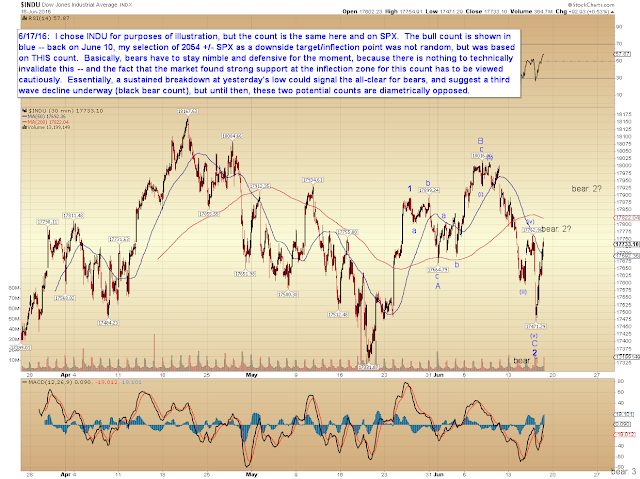 SPX hit 2085.65, then turned and dropped like a rock to new lows. It went on to capture the 2054 target, which was also mentioned as an inflection zone -- and inflect it did, launching SPX all the way back up to almost 2080. That's a pretty solid double-round-trip call. Now things get a little more tricky. I'm going to try to keep things as simple as possible today, given how complex things truly are. I didn't detail the SPX chart, but the potential counts are essentially the same. For our last chart, let's look at NYA, simply because I detailed the chart, and it does suggest that the zone around yesterday's high is an inflection point. 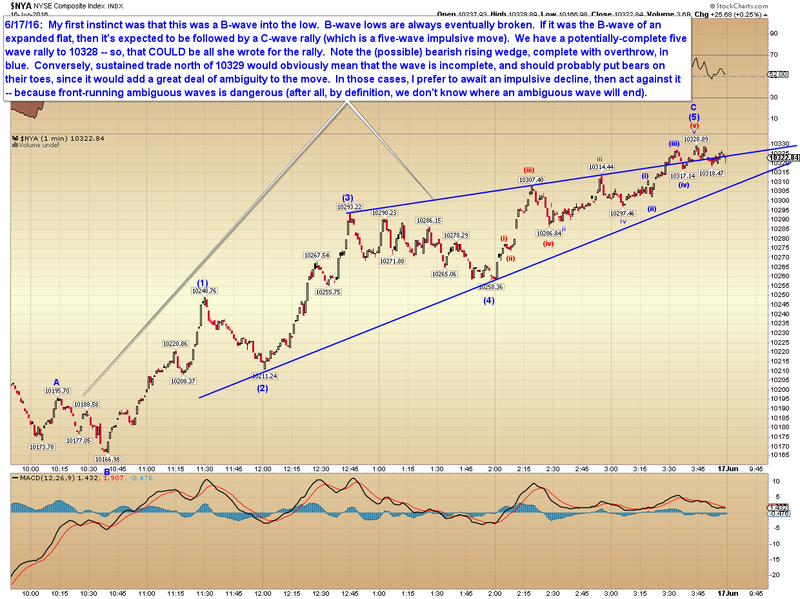 It's entirely possible bears could turn it right back down from here. In conclusion, yesterday's low appears to represent a monster inflection point, and could be the dividing line between "very bullish" and "very bearish." So, what am I favoring? Well, this is a very difficult call, so I want readers to understand that this is not a "high confidence call" (Wednesday, when I wrote: "I expect the market will then be sold to new lows." is an example of a strongly-worded high confidence call.) -- but I'm leaning slightly toward the bears here. This is NOT "mortgage the house and go fully leveraged short with no stops!" territory by any means. The bull count is wholly viable, and the market bounced RIGHT off the inflection point. That has to be respected. But I'm slightly inclined to think the bears will turn it around. Be aware that if they can't do that fairly directly, then it's entirely possible they won't do it until we retest the zone around 2120. And if they can't turn it back down today, then it's possible they won't do it at all. Protect yourself accordingly. 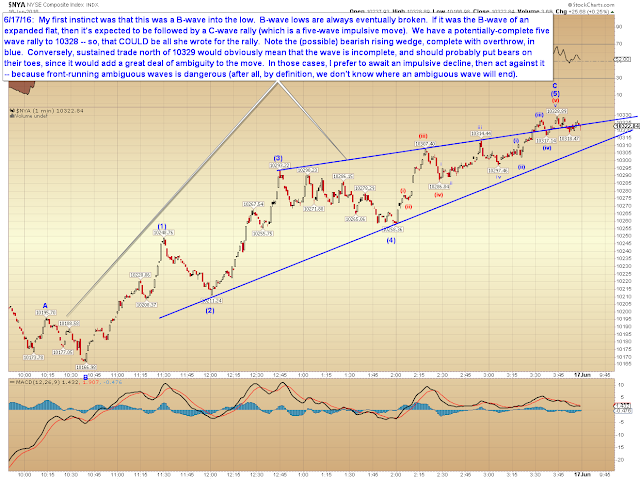 Said more simply: Yesterday's high could be treated as a pivot zone, and a zone to act against. But if we clear that zone, then things get ambiguous, and possibly dangerous for bears. 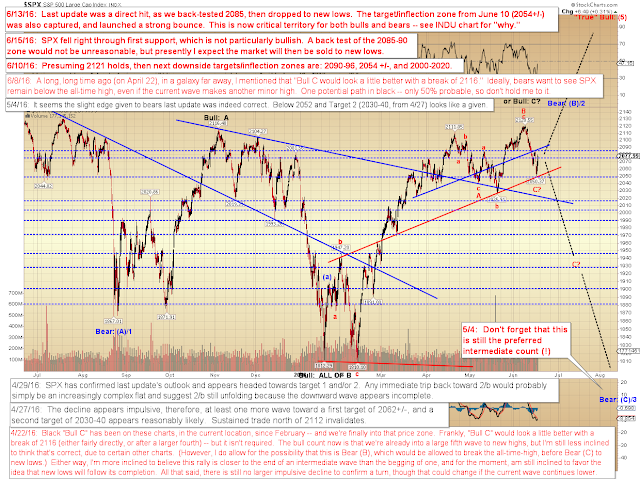 Vice-versa for bulls, with SPX 2050 -- that zone is also likely to function well as a pivot. Trade safe.